Free yourself from the pressures of ‘perfect parenthood’ and discover a simpler way for the whole family to thrive. Families live better with less: less clutter, uncomplicated meals and positive discipline. Simple Happy Parenting provides practical tools and expert advice to help you live well with your family. Denaye Barahona’s revolutionary approach to parenting, challenges us to tackle the most cluttered corner of our lives: childhood. Discover the benefits of a few, carefully curated toys; easy, nourishing meals around the family table; and simple (yet positive) discipline. Children are imaginative, inventive and curious – and it is by allowing them the space and freedom to grow and develop that parents best enable them to flourish. This natural approach to family life is not only good for your child, it is good for parents too. Once we free ourselves from the pressures of perfect we are all able to embrace a more balanced and fulfilling life. 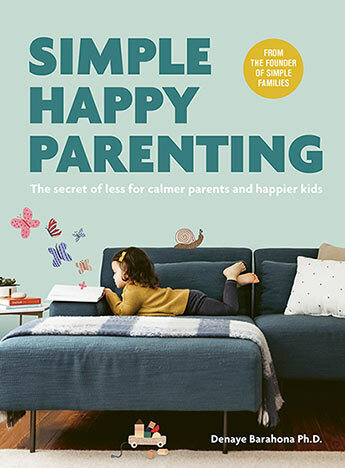 Packed full of straightforward solutions, Simple Happy Parenting is a refreshing voice of calm support for all parents seeking a better, simpler way. Denaye Barahona is the inspirational voice behind Simple Families blog, podcast and community, where she spreads her simple solutions for thriving in motherhood. A clinical social worker with a speciality in child and family practice, and a Ph.D. in Child Development, Denaye has spent much of her career working with parents who deal with challenging behaviour in children. From her on-the-job training as a mom and her professional experience, Denaye has learned how desperately all parents want to get everything right – yet in the process, have the tendency to overcomplicate, over-think and get overwhelmed. Denaye’s refreshing philosophy is that simple really is smart. She advocates taking a holistic approach to helping the whole family stay well: physical, emotional and relational. That means living well by developing a healthy relationship with yourself, your family and your home.